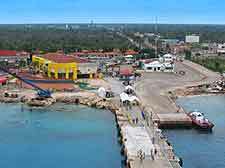 Situated off the Avenida Rafael Melgar and the Carretera Transversal, the island's two major roads, is Cozumel International Airport (CZM). Driving conditions on Cozumel are pleasant and hiring a car is an ideal way to leisurely explore the stunning natural sights that the island possesses. Reserving a car in advance of your trip to Cozumel Mexico will ensure that you get the exact vehicle that best suits your driving requirements. Booking ahead invariably gives you more competitive rates than those available on arrival at the airport and in San Miguel. Renting a car is a popular option for travelling around the island and Quintana Roo area. However, it is advisable to avoid jeeps, as air-conditioned cars are much more comfortable and provide the perfect way to stay cool when driving around in the hot and sunny weather, which is a regular occurrence in Cozumel. Signposts tend to be poor and therefore maps are always advisable when driving both in and around the resort of San Miguel de Cozumel. Many people choose to walk around the town centre or use one of the numerous inexpensive taxis, as parking spaces are always hard to find. Book your Cozumel Car Rental here.